Whether you're a wing player or an inside player, basketball is a game of dribbling and shooting; you can't deny that. The more you can do with the ball in your possession, the more impact you can have on the game. If you have the ball in your hands you need to DRIBBLE in order to get somewhere. The more SKILLED you are as a dribbler, the more FREEDOM you'll have to create for yourself and your teammates. The only way to get to a high level in dribbling is with basketball dribbling drills. This may be the most practical drill of all and the most simple. DRIBBLE EVERYWHERE YOU GO. That's it. Place a few cones (use anything, like chairs, boxes, whatever you have... ) in a straight line on the ground/court. Now dribble the ball LEFT TO RIGHT IN BETWEEN EACH CONE. The key here is to get good at changing directions with your dribble. 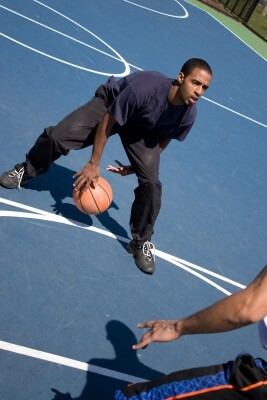 Squat down (bending down with your knees bent) dribble the ball as low as possible with your right hand for 5 minutes, then switch to your left hand. Keep doing this going back and forth. The key dribbling is strength in the fingers. If you're not a great dribbler, this is going to be hard in the beginning, but thats OK. Keep doing this and you will see improvement after some time. Get two basketballs, one for each hand, and start dribbling with both. Now this will be hard if you're a beginner, especially with your off hand, but STICK WITH IT. It will become easier. The idea here is, if you can control two balls well then controlling one ball is EASY! Now check out this video of Michael Conley of the Memphis Grizzlies doing all sorts of advanced fancy tricks with two balls. Don't get scared; he's a pro who's been dribbling for many years, but if you keep practicing, you will get there too! Pistol Pete Maravich, one of the greatest basketball players of all time, was a wizard with the basketball. Here's a video of him going over some VERY IMPORTANT/USEFUL DRIBBLING DRILLS with the great Boston Celtics coach Red Auerbach. Pay close attention to what he says and what he's doing. Sit in a chair and dribble the ball on the floor as you're sitting in it. Dribble around the chair and underneath the chair from left to right. Do this whenever you're sitting somewhere. Just start dribbling, but keep your head up. Do not look down at the ball. In a game, you need to be looking up for open teammates and defenders. If you're looking down, you're going to lose the ball or get it stolen. Do everything you would do in a game: control the ball, dribble fast dribble slow, up and down the court, between your legs, behind your back, spin, stop and go.